Making an infill has been on my bucket list for quite some time now. Making tools to me is more of a hobby than the actual woodworking. If you are looking to build an infill, you’re welcome to follow me along. I’ll try to keep the blog as up to date as time allows and would love feedback from others taking the same path. The metal work of the infill intimidated me a bit and I’m not really sure why. 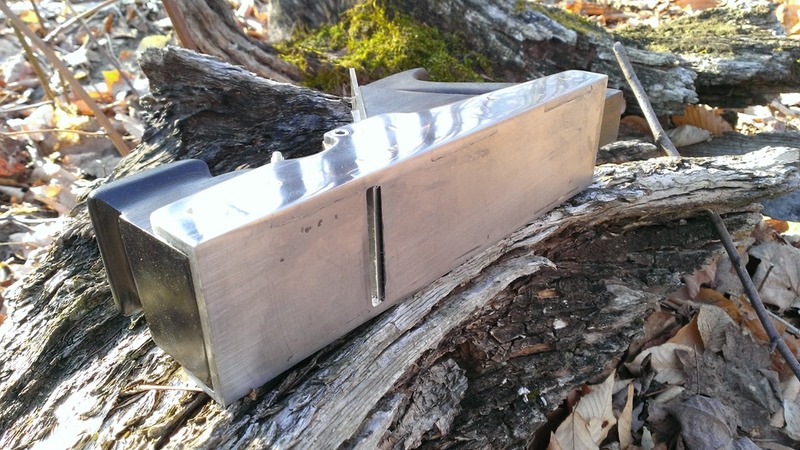 I can weld, I’ve done my share of body work, gunsmithing and tin work, but the finish type metal work seems beyond my capabilities, which is why my first few I made from existing plane bodies. But I’ve come to the realization that fitting the infill into an existing body is a lot of extra work you don’t have when you make your own body. And the metal work…….well it doesn’t need to be that intimidating. I’ll work through some of my issues, some of my mistakes, and some of the processes I’ve dug up. I spent a lot of time researching and looking at infill planes. So first, if you’re thinking of following along, let’s talk tools. I’m still basically (for the hobby part of my life) a woodworker. 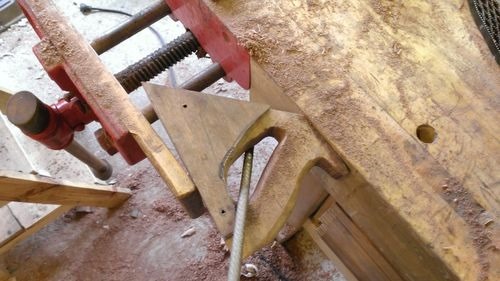 Almost all of my tools are woodworking tools with a few exceptions. So let talk about the exceptions. I have a horizontal metal bandsaw. I’ve had it forever and just discovered I can also use it vertically. In my defense, until now I’ve never had a need to use it vertically, so there’s my excuse for that bit of foolishness. 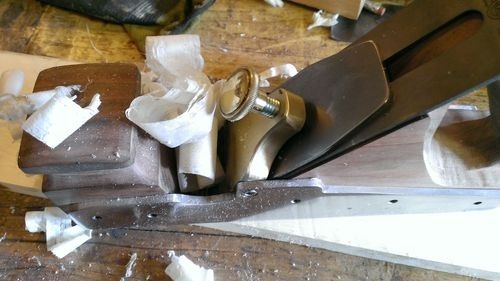 Almost everything online tells you you can do the cutting with a hacksaw, and I guess theoretically it’s true. 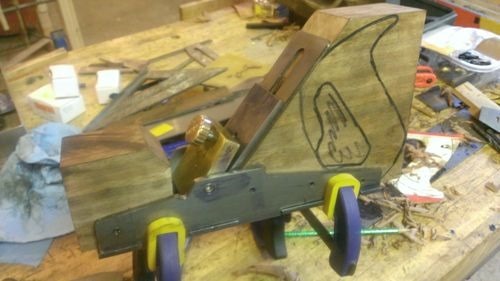 Even some of the professionals who have how-to blogs say they cut the planes out with a hack saw. I say bull crap. I think they are telling us that so we don’t find better ways to make our own. If I had to cut them all with a hack saw, I’d be back using the existing blanks. Files. You’re going to need files. Because of all my other hobby’s, one of which is buying box lots of crap, I’ve got a pail full of files. Flat ones, round ones, triangles shaped ones, some that work well, some that should become tent stakes, but you get the idea. If you’re new, and don’t have a pail full of files, plan to buy quit a few. A good hack saw, sanding equipment, good epoxy, countersinks, drill bits, drill press, and metal marking tools. Taps. You’ll need several sizes for the cap, depending on how you plan to attach it. A way to polish. Shiny is good in the infill world. 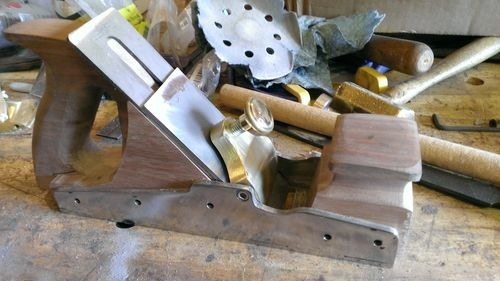 This can be done with sandpaper but for brass, you’ll really need a wheel and compound. You can use a sharpy to color the metal to scribe with, but layout die is >$4 for a bottle. And if you smart enough to not dump half the bottle all over your bench (yes I did) it will last a very long time. A metal scribe. Again, I paid $3 something with a mcmaster carr order. Spend the few bucks. 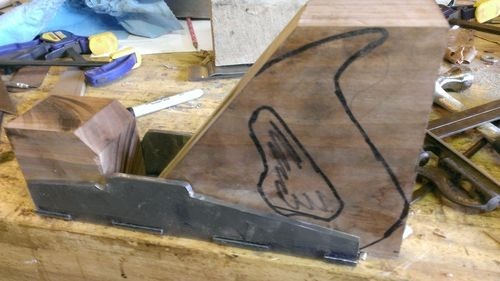 It’s easier to use a metal scribe on wood, than the other way around. Pick your size. I recommend staring with a smoother or jack. Something mid-size. Don’t go to small or too big to start. 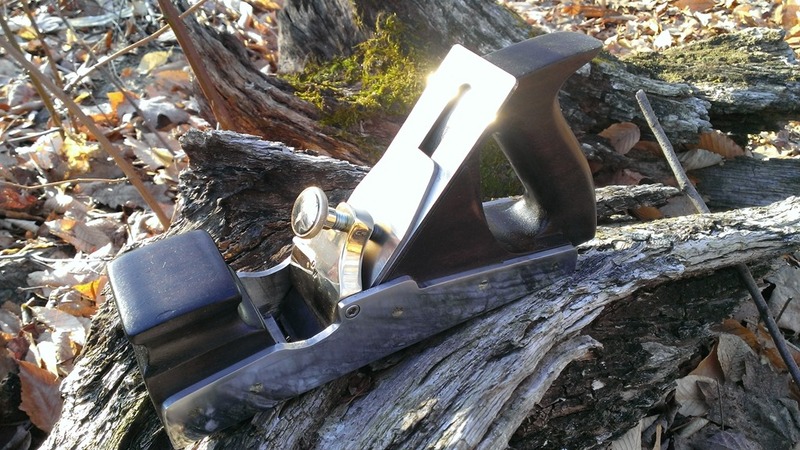 20° and under — Used for low angle planes such as mitre planes, shoulder planes and block planes. 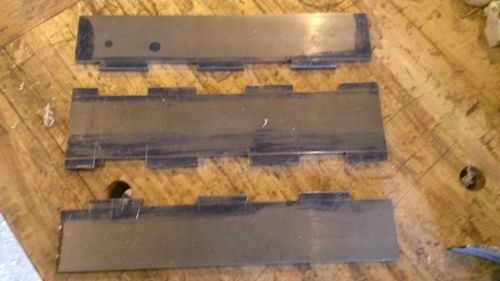 The blades for these planes are used with the bevel up, which has the effect of increasing the overall pitch by the amount of the bevel angle. 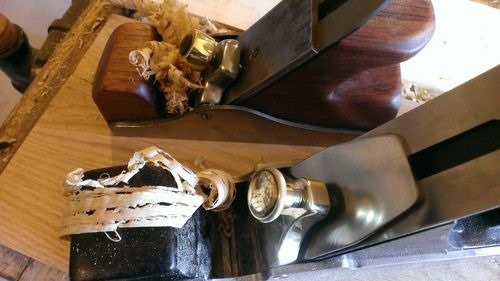 As these planes are usually used for end grain work, having a lower angle with the blade supported right to the tip and a fine mouth opening is a major advantage. 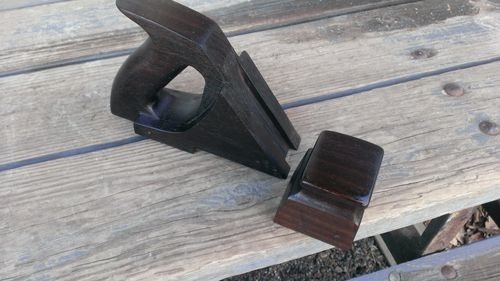 45° (Common Pitch) — Used for most bench planes, from wooden bodied ones to Stanley/Bailey type. 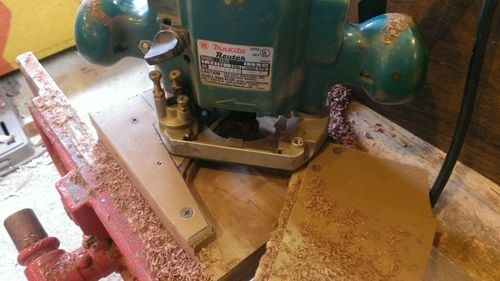 A bedding angle set at 45° is optimum for most softwoods and straight grained hardwoods and the blade is used with the bevel down, requiring a chipbreaker in most cases (especially when using a thinner blade). 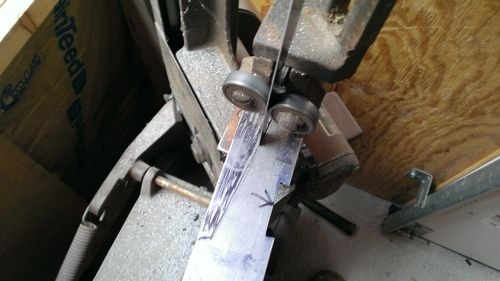 Japanese style planes don’t need a chipbreaker because the blades are usually quite thick. 50° (York Pitch) — Used for hardwoods and is especially useful for highly figured and interlocking grain. Also used for rebate (rabbet) planes and some grooving planes. 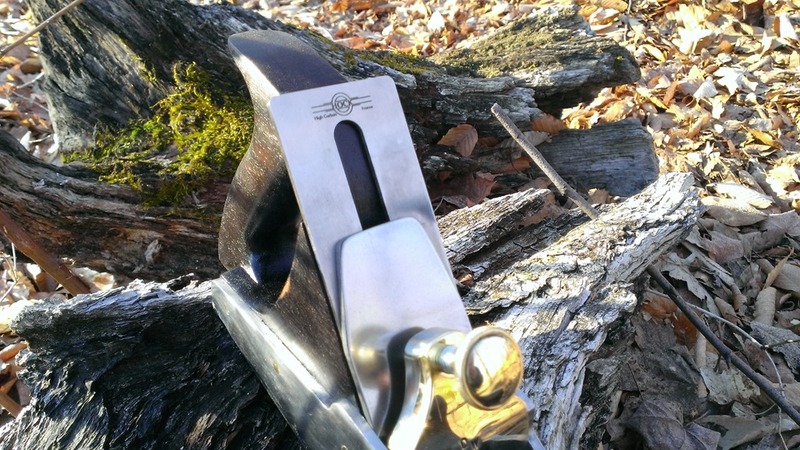 55° (Middle Pitch) — Mainly used for molding planes for softwoods. I’ve found my 55° works very well even in some hardwood. 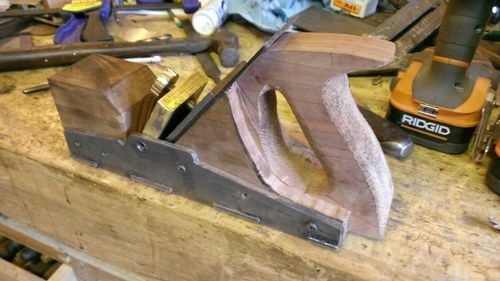 60° (Half Pitch) — Used for molding planes for hardwood. 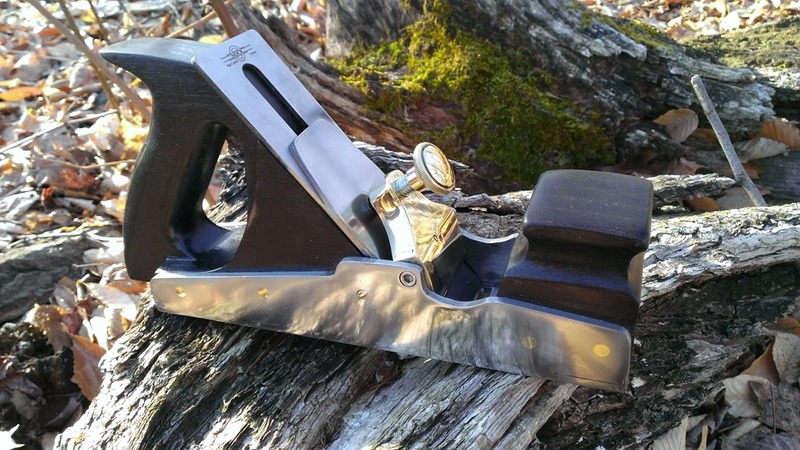 70° to 90° — Used for toothing planes, side snipers and side rebate (rabbet) planes. 90° plus — Scrapers and scraping planes. Have some JB Weld on hand. It’s like wood putty for covering up your metal mistakes. And if you need to buy the metal, figure out what you want. There is a lot of information about what to get, so here is a recap. Note none of this is set in stone, and slight variations are of little consequence. For the sole you can use anything from 3/16” up to 1/2”. Go with the 3/16” or so if you are going to dovetail, go with 1/2” if you are going to pin or screw. As for the kind, it doesn’t seem to matter. Grab the hot rolled your local box store has, or order some low carbon, O1 or 1018 online. Remember if you’re going to dovetail to add in the width. Sides. I’d suggest 1/8” or 3/16”. This can be Metal, brass or bronze. I’ve read Bronze 464 or Brass 220 is good, but again, it seems lots of guys use lots of different material with very similar results. Use 1/8” for the chip breaker. I’ve been using Hock Irons. 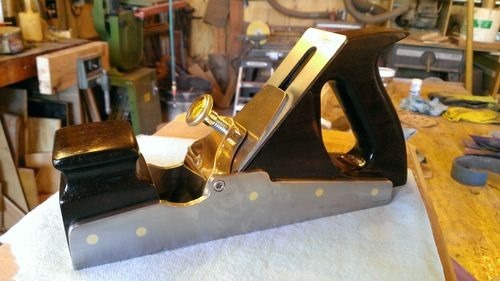 First they are exceptional, second Ron Hock will answer your questions, 3rd he doesn’t make planes, so your plane won’t be mistaken for a Ron Hock plane. —Dovetailed metal. Cool to look at, and a solid base. —Pinned. Again, cool to look at and you’ve got some choices depending on your metal and your style. You can match the pins to the metal and make them virtually invisible or use contrasting pins. —Screwed. You can tap the base and screw the sided. Again some choices. Countersink and level them showing (actually one of my favorites) cut the heads and peen them over and make the flush. Again with like metal to make them invisible or contrasting to make them stand out. Welded. 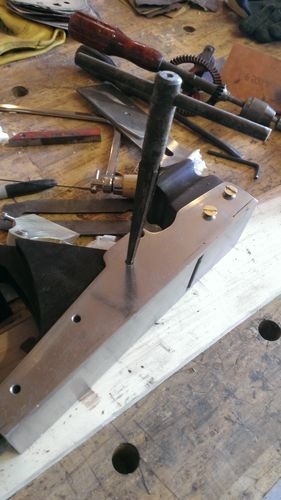 You can weld the sides to the base. Here you’re limited to metal all the way, but it’s an option I plan to at least try. 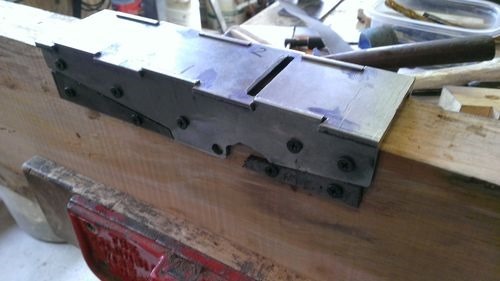 Next we’ll talk about dovetailing the metal. I’ll bet you’re right on the edge of your seat! 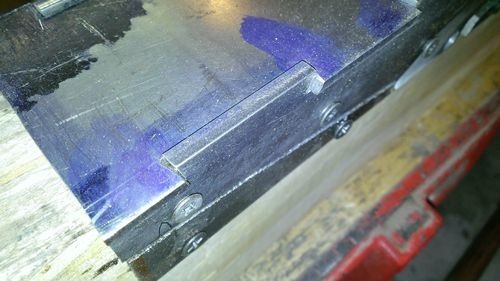 As I stated in the first part, there are several ways to connect the sides of an infill to te sole. 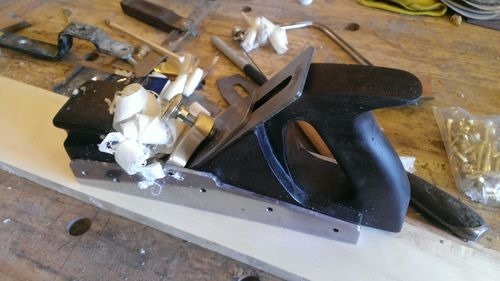 In this plane I’ll try my hand at dovetailing. 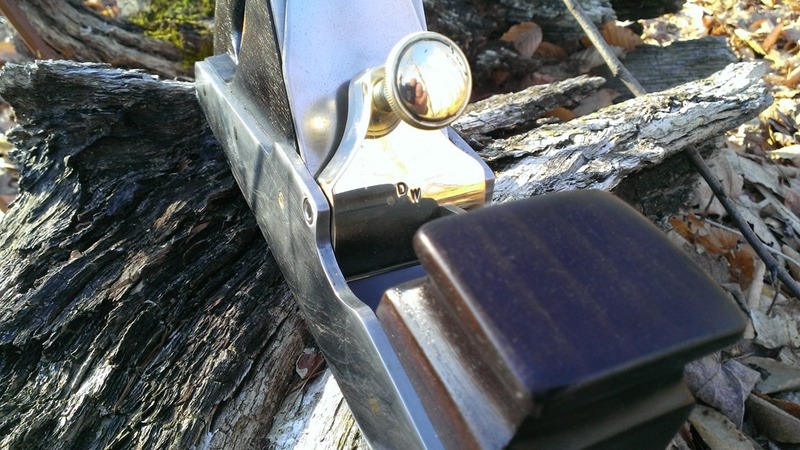 There are numerous videos, instruction and blogs about cutting the dovetails. I suggest you watch them all. I am pretty sure I did. 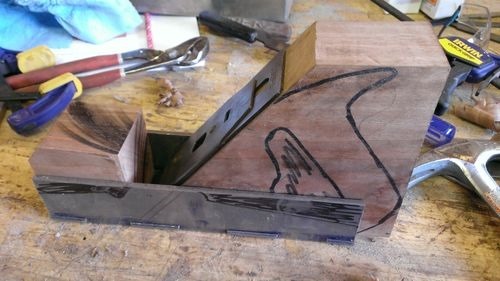 For the woodworking folks around here, the layout isn’t really any different than wood. Add some layout fluid, and use the same tools you use for a drawer. A straight edge, layout guide and dovetail marker all work. I used 12 degrees. I cut the sides first, then the bottom. On this plane I cut the hole for the mouth into a solid piece. I will not do that again. I’ll make the sole in 2 pieces. Lay out all pieces, at least roughly before cutting anything. Once you have the sides laid out, cut as much as you can with the hack saw or bandsaw. 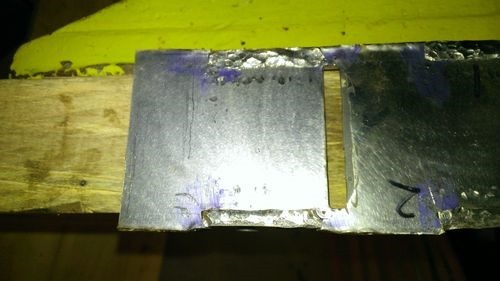 A good metal blade in a sawzall should work as well. Then file away. Pay attention to your lines, and make sure you use files with a safe edge were required. 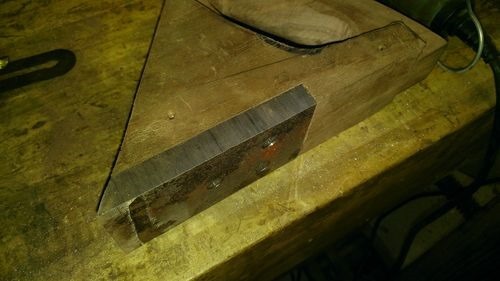 I made a angle piece of wood as a guide for the bandsaw. I cut as much as I could from all angles. The very outside cuts of the bottom I made with a hacksaw to keep accuracy. Once the sides are cut, scribe the bottom. Cut them out as well. I kept the sides with me all the time to match up. I constantly put thing together to test it. The was a design as you go project. Also keep the parts marked. You need to constantly remark because the marking wear off quick. 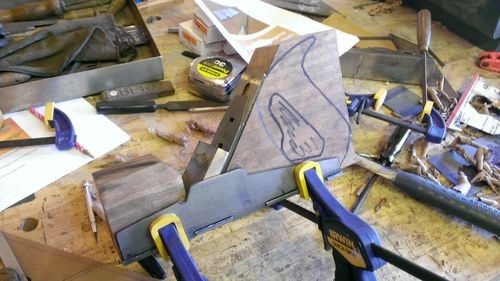 Next I marked out the side pattern and cut it on the bandsaw. Then put it back together again. I then cut the holes by placing the sides together. I had a problem with this and wound up moving the hole. When I cut the dovetails I wasn’t concerned about them being exact from side to side. That wasn’t an issue other than it moved the hole on one side when I lined it up. When you drill through, make sure you’ve got a good reference. Then I filed the secondary bevels. This is to allow for the lock to work in all directions. Its the same angle as the primary bevel. Next I made the peening rack. And took to peening. I wound up using the largest peening hammer I had. It was a combination of the hammer and a large punch. And of course I had to try it. I apologize for the lack of pictures. More will come. So making the infill wasn’t so bad. Its so much easier when make a base. 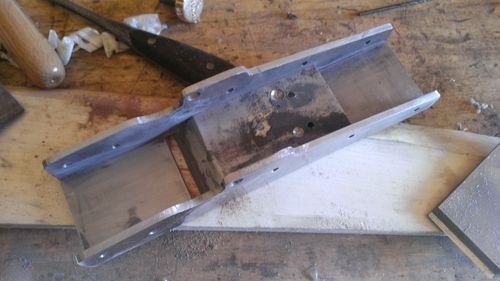 When you make the base, its square and true, unlike the inside of the cast vintage planes, so making and addind the base is much easier. I choose walnut for this, and after some help from my friend over on the HPOYD thread, I decided to ebonize it. Most of this is just normal woodworking, at least for the first part. I decided to make this one in 1 piece. I’m not sure it’s really important and the others I didn’t. I don’t see much difference in the outcome. I used the router to cut it out. I drilled the center, cut it with a scroll saw and shaped it with some rasps and files. constant fitting to ensure it was going right. Once it was formed and sanded, It was time to darken it. I had some issues with the ebonozing. I took some white vinegar and stuck some steel wool in it. After several days nothing had happened. I made sure i was using real steel wool. After some reading and some help from the guys over on the HPOYD thread, I threw some rusty nails in it and put the heat gun to it. If your doing this it is advisable to keep the cap loose and be in a well ventilated area. I then gave it several coats of dark walnut danish oil. Its not ready, but lets try it out anyhow. Now to fasten it in. I drilled the side hole just a little smaller than some #12 brass screws, and used a reamer to give it a slight taper, along with a countersink to give the holes a little countersink. I then drove the screws as tight as I could into the countersink. Note, you need slotted screws for this. With Philips head screws, the Philips cut out goes to far down into the shaft. I then took the grinder to the screws, sanded the sides with my ROS, from 80 grit up through 320, and buffed it out. The the knob and tote got a couple coats of wipe on poly. 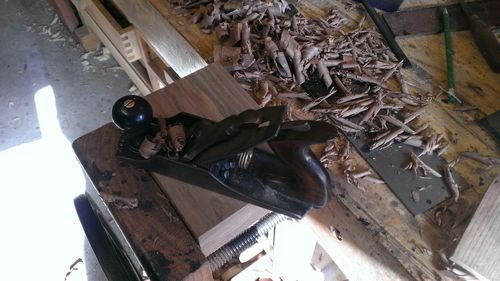 I also realized I didn’t take any pictures of making the cap iron or lever cap, so next plane for sure. The cap iron is 1/8” O1, drilled and tapped, given a slight bend into the iron, the end ground at an angle and polished up. I’ve estimated I have between 30-40 hours in this plane. 4. Steel. A drop means a dent, and maybe some wood damage which is repairable. 7. You get the more solid, vibration dampening, blade bedding of a wooden plane with out the sole wear issues. Next post A #3 Size Infill.